I will tell you how to paint those plastic skinks easy to a descent RaF standard. I say RaF because these method is great for painting huge masses of skinks. Used Paints: green ink,flesh wash, brown ink, burnished gold, blood red, bubonic brown, bestial brown, goblin green, dark angels green, skull white and bleached bone. First you need to cut the skink from the sprue, file away any mold lines and flash, and glue it to its base. 1) Undercoat the skinks with a white spraycan. 2) Paint the entire skink dark angels green. 3) Glue sand on the base with PVA(white wood glue). 4) drybrush the entire skink with goblin green. 5) as skinks are aquatic, and so look glossy, wash the entire skink with green ink. - eyes, loincloth and arrow bag blood red. - bow and toenails bubonic brown. - belts and bracelets bestial brown. 7) - to add depth to the arrow bag and the loincloth, wash it with flesh wash.
- paint the bracelets burnished gold. - Paint the sand on the base bestial brown. - drybrush the sand on the base with bubonic brown. 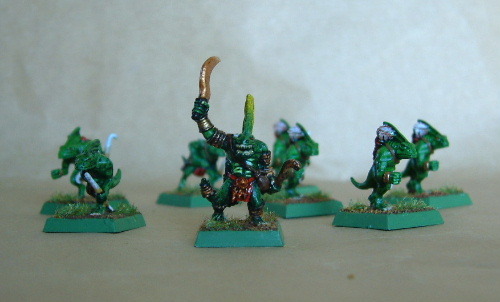 - paint the sides of the base goblin green. The colors I used where just an example, this method works with any colors.